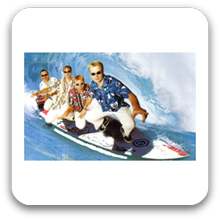 Sydney Band 559 – Wouldn’t it be nice if the good vibrations and California sun could wipe-out the summertime blues ! Well stop California dreaming, because with Sydney Band 559, the tequila will flow & everybody will twist & shout and dance dance dance all night long. God only knows the fun fun fun the boys will have, but the word in the pipeline is they are hangin’ five to turn your venue or function into a summer holiday. The California girls and noble surfers will be surfin’ u.s.a. And cruisin’ in your very own surf city ! As the boys get around be quick to book them for your club, pub or function & let’s all live 4 the sun !!! Sydney Band 559 brings alive the sounds of the beach & classic 60’s mixing it with the retro sounds of the 70’s & 80’s and spicing it up with the modern classics that are currently on the radio. Sydney Band 559 revives the spirit, fun and the fantasies of those golden years, the sunlit world of beach parties, surfing, hot rods and California girls”. P.s bring the sunscreen, you could blister in the sun! Do You Wanna Dance / Oh Boy!